This time of year, nothing goes better with too much eggnog than grim tales of murder. (That’s how we roll at True Crime, anyway.) 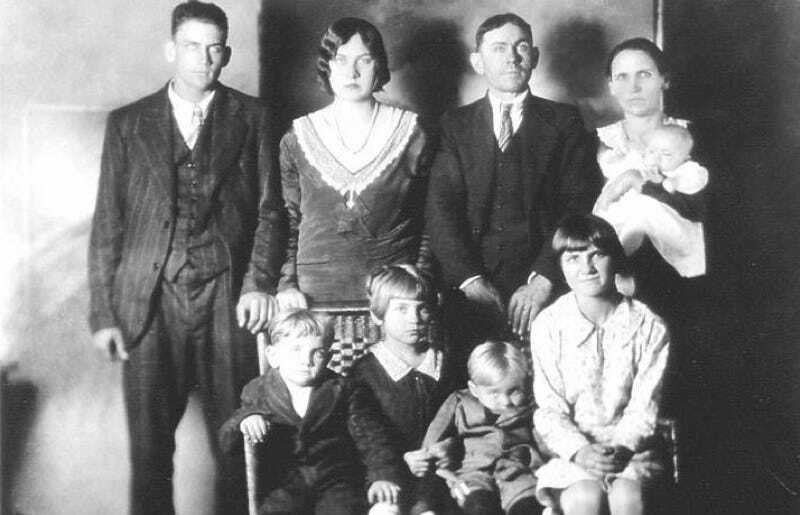 The first in our series takes place in 1929, on a farm outside Germanton, North Carolina—where on Christmas Day, Charlie Lawson murdered his family before taking his own life. It was a crime as methodical as it was horrifying—and baffling, too. The victims included six of Charlie Lawson’s seven children (an eighth child had died years prior of pneumonia) and his wife of nearly 20 years, Fanny. The youngest, Mary Lou (seen in Fanny’s arms in the portrait above, which was famously taken shortly before the massacre), was just four months old. Oldest son James Arthur, who was 16, survived only because he’d been sent on an errand that fateful afternoon. The errand was an eerie one: Arthur (nicknamed “Buck”) and his cousin trudged through the snow into Germanton to buy more shotgun shells. When Buck returned, he was greeted with the bloody horror of his mother, sisters Marie (17), Carrie (12), Maybell (7) and baby Mary Lou and brothers James (4) and Raymond (2), all slaughtered by the family patriarch. They’d been picked off one by one, and Charlie had apparently chased down Carrie and Maybell as they ran away in terror. Some had been killed by gunshot, others by bludgeoning, and others by a combination of the two. All of their bodies were either in the family’s small house, or in the adjacent tobacco barn. Some accounts reported that Charlie had placed stones over their eyes. The only Lawson family member missing from the scene was the culprit, Charlie, who’d gone into the woods to shoot himself after he’d completed his terrible deed. The shot was said to be overheard by law enforcement who were investigating the crime scene. Local legend has it that there were pace marks in the grass near where his body fell, indicating he’d nervously walked in circles before finally pulling the trigger. “CRAZY FARMER KILLS WIFE, 6 CHILDREN,” announced no less an authority than the New York Times the next day. Rural Stokes County, North Carolina had made the big time, for all the wrong reasons. After the initial shock of what had happened, there was one question: Why? At first, there was no apparent motive. The Lawsons weren’t rich, but they weren’t having any particular financial struggles, and Charlie Lawson wasn’t known to have extreme religious beliefs or exhibit odd behavior. In fact, he was well-respected in the community. Two theories eventually emerged. The first was that Charlie had a medical condition that affected his actions and made him snap that day. Perhaps he’d knocked a screw loose after suffering a head injury while digging a ditch on the farm. Or, as some reported, he had some kind of “painful growth” on his chest that had him in constant agony, and he’d decided to end it all and take his family with him. The second theory was far more salacious; there were rumors that Charlie had impregnated his teenage daughter, Marie, and had killed his family to prevent the incestuous scandal from being known. But the truth, which Charlie took to his grave, will never be known. The killing attracted so much attention that an estimated 5,000 curiousity-seekers attended the Lawson family funeral. They were all buried in a single large plot in the private Browder Family Cemetery just outside of Germanton. In the aftermath of the murders, the Lawson farm became a tourist destination. Extended family members who lived in the area started charging admission for tours of the property. Though the home was later demolished, the area still has enough spooky history to have inspired ghost sightings of the doomed Lawson children, and of murderous Charlie Lawson. Unbelievably, the tragedy of the Lawson family didn’t end in 1929. In 1945, James Arthur Lawson, the only child to survive the Christmas Day bloodshed, died at the age of 31 in a truck accident in Walnut Cove, NC—quite near Germanton. He was buried in the same cemetery as the rest of his family, leaving behind four children of his own. If this chilling holiday story sounds custom-made for a murder ballad—well, several artists over the years have drawn inspiration from it. Documentary A Christmas Family Tragedy was released in 2006, but probably the best-known homage came from famed bluegrass duo the Stanley Brothers, who penned a suitably morbid tune recounting the Lawson family’s fate. You can hear a live version of it playing in the video below: “They say he killed his wife at first/While the little ones did cry/Please Papa won’t you spare our lives/It is so hard to die.” Brrr.